Indian cricket team fans can be divided into different categories. After India wins, one category will be so relieved it's almost insulting to the Indian team. Another would say ‘yeah ok they won’. They are the ones with steadfast faith on the team and believe that they lived up to their potential. This is a compliment. Another would have promised to break a million coconuts in temples and all. This is most definitely an insult. They have more faith in the Gods than the men in blue. Please comment which category you belong to and why. The wittiest reply will win a coupon from us. Moving on to what happened at the match. This was a thumping victory for the Indian team doing their best to literally erase what happened at the first ODI. The team ensured that Sri Lanka will never win a One Day International Series in India. Yup. The chase was quick and efficient. There was no stopping India as the partnerships held. The match slipped away from the southern neighbours faster than expected. India walked away with the match and the series, head held high. Dhawan’s 100 and Shreyas Iyer’s 65 took them past the finishing line. With a run rate of 6.80, India hit the target in the 33rd over. Earlier in the day, after India opted to bowl, Sri Lanka went down in heap and quite quickly at that. They were two down when 162 runs were on the board. From that to 215 all out was a really quick journey. And not enjoyable at all. They had it going at one point. It looked like there was no respite for India. Tharanga looked well on his way to a century. He was stopped at 95. Stumped by Dhoni. 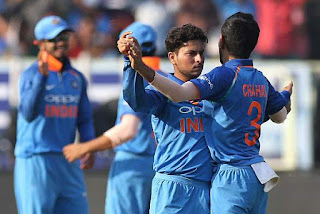 Bowling by Kuldeep Yadav. The only other batsman who gave him company was Sadeera Samarawickrama. He hit 42. After wickets started to tumble, India was right back in the game. Three-wicket hauls by Y Chahal and Kuldeep Yadav. Hardik Pandya took two. B Kumar and Jasprit Bumrah took one each. After a long time, all the bowlers took wickets. India wins the ODI series. Now T20. Keep those lineups coming. We have something special for you as well.